Tiridates III (spelled Trdat; Armenian: Տրդատ Գ; 250-330) was the king of Arsacid Armenia (287–330), and is also known as Tiridates the Great Տրդատ Մեծ; some scholars incorrectly refer to him as Tiridates IV as a result of the fact that Tiridates I of Armenia reigned twice. In 301, Tiridates proclaimed Christianity as the state religion of Armenia, making the Armenian kingdom the first state to embrace Christianity officially. Tiridates III was the son of Khosrov II of Armenia by an unnamed mother, the latter being assassinated in 252 by a Parthian agent named Anak under orders from Ardashir I. Tiridates had one known sibling, a sister called Khosrovidukht and was the namesake of his paternal grandfather, Tiridates II of Armenia. Anak was captured and executed along with most of his family, while his son, Gregory the Illuminator, were sheltered in Caesaria, in Cappadocia. Being the only surviving heir to the throne, Tiridates was quickly taken away to Rome soon after his father’s assassination while still an infant. He was educated in Rome and was skilled in languages and military tactics; in addition he firmly understood and appreciated Roman law. The Armenian historian Movses Khorenatsi described him as a brave and strong warrior who participated in the battles against enemies. He personally led his army to victories in many battles. In 270 the Roman emperor Aurelian engaged the Sassanids, who had now replaced the Parthians, on the eastern front and he was able to drive them back. Tiridates, as the true heir to the now Persian-occupied Armenian throne, came to Armenia and quickly raised an army and drove the enemy out in 287. When Tiridates returned to Armenia, he made the city of Vagharshapat, his capital in the kingdom as Vagharshapat was the capital of his late father. For a while, fortune appeared to favour Tiridates. He not only expelled his enemies, but he carried his arms into Assyria. At the time the Persian Empire was in a distracted state. The throne was disputed by the ambition of two contending brothers, Hormuz and Narses. The civil war was, however, soon terminated and Narses was universally acknowledged as King of Persia. Narses then directed his whole force against the foreign enemy. The contest then became too unequal. Tiridates once more took refuge with the Romans. The Roman-Armenian alliance grew stronger, especially while Diocletian ruled the empire. This can be attributed to the upbringing of Tiridates, the consistent Persian aggressions and the murder of his father by Anak. With Diocletian's help, Tiridates pushed the Persians out of Armenia. In 299, Diocletian left the Armenian state in a quasi-independent and protectorate status possibly to use it as a buffer in case of a Persian attack. 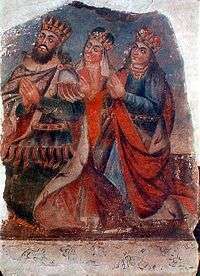 Tiridates married an Alani Princess called Ashkhen in 297 by whom he had three children: a son called Khosrov III, a daughter called Salome and an unnamed daughter who married St. Husik I, one of the earlier Catholicoi of the Armenian Apostolic Church. The traditional story of the conversion of the king and the nation is primarily based on the fifth-century work of Agathangelos titled “The History of the Armenians.”  It tells of how Gregory the Illuminator the son of Anak, who was brought up as a Christian who, feeling guilt for his own father’s sin, joined the Armenian army and worked as a secretary to the king. Christianity in Armenia had a strong footing by the end of the 3rd century but the nation by and large still followed pagan polytheism. Tiridates was no exception as he too worshiped various ancient gods. During a pagan religious ceremony Tiridates ordered Gregory to place a flower wreath at the foot of the statue of the goddess Anahit in Eriza. Gregory refused, proclaiming his Christian faith. This act infuriated the king. His fury was only exacerbated when several individuals declared that Gregory was in fact, the son of Anak, the traitor who had killed Tiridates’s father. Gregory was tortured and finally thrown in Khor Virap, a deep underground dungeon. During the years of Gregory’s imprisonment, a group of virgin nuns, led by Gayane, came to Armenia as they fled the Roman persecution of their Christian faith. Tiridates heard about the group and the legendary beauty of one of its members, Rhipsime. He brought them to the palace and demanded to marry the beautiful virgin; she refused. The king had the whole group tortured and killed. After this event, he fell ill and according to legend, adopted the behavior of a wild boar, aimlessly wandering around in the forest. Khosrovidukht had a dream wherein Gregory was still alive in the dungeon and he was the only one able to cure the king. At this point it had been 13 years since his imprisonment, and the odds of him being alive were slim. They retrieved him and despite being incredibly malnourished he was still alive. He was kept alive by a kind-hearted woman who threw a loaf of bread down in Khor Virap every day for him. 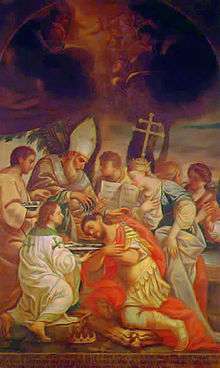 Tiridates was brought to Gregory, and was miraculously cured of his illness in 301. Persuaded by the power of the cure, the king immediately proclaimed Christianity the official state religion. And so, Armenia became a nominally Christian kingdom and the first state to officially adopt Christianity. Tiridates appointed Gregory as Catholicos of the Armenian Apostolic Church. While as a matter of fact the conversion to Christianity proved to be decisive and pivotal in Armenian history, it seems that the Christianisation of Armenia by the Arsacids of Armenia (Arshakuni) was partly in defiance of the Sassanids. The switch from the traditional pagan Armenian religion to Christianity was not an easy one. Tiridates often used force to impose this new faith upon the people and many armed conflicts ensued, because polytheism was deeply rooted in the Armenian people. An actual battle took place between the king's forces and the pagan camp, resulting in the weakening of polytheistic military strength. Tiridates thus spent the rest of his life trying to eliminate all ancient beliefs and in doing so destroyed countless statues, temples and written documents. As a result, little is known from local sources about ancient Armenian history and culture. The king worked feverishly to spread the faith and died in 330. Movses Khorenatsi states that several members of the nakharar families conspired against Tiridates and eventually poisoned him. Tiridates III, Ashkhen and Khosrovidukht are Saints in the Armenian Apostolic Church, and by extension all of the Oriental Orthodox Churches, and their feast day is on the Saturday after the fifth Sunday after Pentecost. On this feast day To the Kings is sung. Their feast day is usually around June 30. Tiridates III with his wife Ashkhen and sister Khosrovidukht by Naghash Hovnatan. ↑ Binns, John. An Introduction to the Christian Orthodox Churches. Cambridge: Cambridge University Press, 2002, p. 30. ISBN 0-521-66738-0. 1 2 (Armenian) Grigoryan, V. «Տրդատ Գ Մեծ» (Tiridates III the Great). Armenian Encyclopedia. vol. xii. Yerevan, Armenian SSR, 1987, p. 94. ↑ (Armenian) Movses Khorenatsi. History of Armenia, 5th Century (Հայոց Պատմություն, Ե Դար). Gagik Sarkisyan (ed.) Yerevan: Hayastan Publishing, 1997, 2.79. ISBN 5-540-01192-9. ↑ Barnes, Timothy David, Constantine and Eusebius, (Harvard University Press, 1981), 18. ↑ This story is recounted by the Armenian secretary Agathangelos in his History of St. Gregory and the Conversion of Armenia. ↑ Movses Khorenatsi. History of the Armenia, 2.92. Wikimedia Commons has media related to Tiridates III of Armenia. Translated from the Armenian: Mihran Kurdoghlian, Badmoutioun Hayots, A. hador [Armenian History, volume I], Athens, Greece, 1994, pg. 96-105.